Of all the features that Instagram has to offer, Stories is my absolute fave. Because it’s where I can get really creative. I can add doodles, polls, stickers and do cool things like donut selfies, create Story Highlights on my profile or have a little fun with GIF Challenges. Honestly, Instagram Stories are fun because I can execute creative ideas without breaking my precious Instagram grid theme PLUS Instagram Stories are great for engagement! I remember when I first started using Instagram Stories, I had my lead magnet as my bio link and after each story I’d get a few new email subscribers. 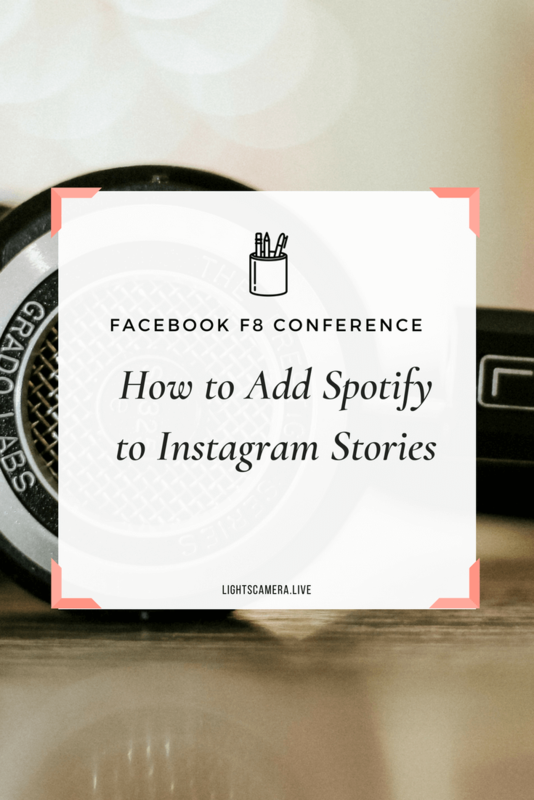 So yesterday when Instagram announced at the Facebook F8 conference that they were creating new ways for users to get creative with Instagram Stories, my ears perked up! Zuckerberg announced that Instagram users can now share their favorite songs in Instagram Stories thanks to the new Spotify integration. When you’re listening to a song on the Spotify app and feel like sharing it with friends, click on the three dots by the song. Next, click on “Share” from the menu then click on “Instagram Stories”. A sticker featuring the song will appear in Instagram Stories. From here, you can do whatever you want and add more details to your story (e.g., add stickers, text, etc.). When you're done editing your story, publish your story or send it as a Direct Message. When followers see the Spotify song sticker in your Story, they can then click on the sticker and the song will start playing in their Spotify app. Let’s say you’re headed to the gym to work out, instead of just sharing one song you can share an entire playlist or album! To do that, you just select your playlist or album on the Spotify app, click the share button and choose Instagram Stories. Most podcasters I know usually have to create a separate graphic or video to promote their latest episode and then turn around and upload the creative to Instagram Stories to drive downloads (aka more work). Hooray for streamlining content promotions! What do you think of Instagram’s Spotify integration with Stories? Do you like it? Share your thoughts in the comments below. P.S. To follow my Instagram Story shenanigans and future “drop it like it’s hot” playlist selections, make sure to follow me on Instagram at @heystephanieliu. Enjoyed this post? Share it on Pinterest!